We're so used to seeing cables from this marque that it's easy to forget the company's origins, back in 1980, in phono cartridges. 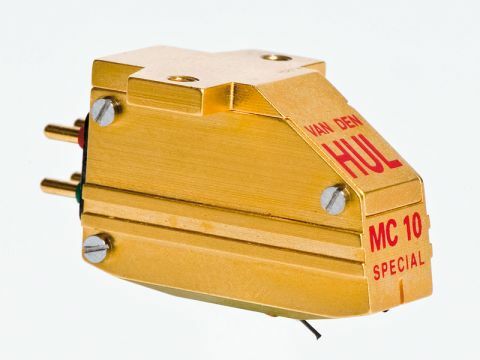 In fact, Mr van den Hul – who still runs the company personally and is a familiar figure at hi-fi shows the world over – made his name as the originator of a successful stylus profile, the VDH Type 1. Not surprisingly, that profile is a feature of this and other van den Hul cartridges, and it has been adopted by other makes, accounting for its use in well over one million cartridges sold to date. Like other special stylus shapes, it aims to minimise the longitudinal contact area between stylus and record groove, so that the stylus doesn't 'average out' the tiny wiggles which would reduce high-frequency tracing accuracy. vdH estimates that this shape is capable of tracing modulations up to 80kHz on a regular 33rpm disc. Few discs ever made will have the slightest sniff of musical information at such a frequency, but a little spare bandwidth never hurt anyone! The MC10's cantilever is boron, and quite long though it looks shorter as part of it is hidden inside the body. The generator assembly uses silver wire and is wound in such a way as to give it slightly higher output than most (from a slightly higher impedance, which isn't really a drawback). It still needs a proper moving-coil input, but makes the noise requirements slightly less arduous. Physically, the MC10 is of typical dimensions and weight and it mounts to the headshell via threaded holes. Its compliance is quite high and, as a result, the tracking force is relatively low, vdH suggesting something in the range of 1.35 to 1.5 grams. Kudos is due to Mr van den Hul for the superb 'Frequently Asked Questions' page on his website – truly everything you ever wanted to know about cartridges and related subjects. By the way, the 'Special' in the name means cartridges are built to order, apparently in a couple of weeks. We found this the most 'civilised' cartridge – others might say 'mellow' or even 'dull' depending on tastes and previous experiences. But the simple fact is that its treble is audibly less bold than that of any others here. On the other hand, it is beautifully detailed and never less than clear, with a really nice sense of natural acoustic space around the performers. The midrange is similarly detailed and has, perhaps, the best stereo imaging here too, precise and admirably stable. There's little 'beyond the speakers' imaging, but realistically it's hard to find discs that give much of that on any system and we'll happily settle for a really good image between the speakers. Depth is good too. Bass is slightly less assured. At low and moderate levels, it is very well extended, but it lacks a little conviction when the music gets loud, slightly lessening its impact. Indeed, impact in general is not what this cartridge does best: it has good but not remarkable timing and prefers a rather more tuneful kind of music. As such, it's certainly very adept with classical music and stuff like ballads, but we also had some very good results with a lot of jazz, where the MC10's ability to separate out instruments and sections goes a long way towards creating a believable ensemble of musicians just beyond the wall. This seems to be an unusually unfussy cartridge when it comes to arms, turntables and phono amps, and its sound was highly consistent in our various setups. It does like a slightly higher arm base than some, and is quite critical of tracking force, or values outside the recommended range tending rapidly towards coarseness (too light) or dullness and lack of sparkle (too heavy). Properly set up, though, it is capable of some very informative music-making, especially with 'unplugged' musicians.